We are thrilled to have nine of South Africa’s most talented photographers and curators presenting at the second edition of DocuFest Africa at the Hilton Arts Festival from September 15-17, 2017. DocuFest Africa is a visual storytelling festival presenting to the public important African documentary projects and the curation of significant African archives. It is being run as a companion to the World Press Photo Exhibition 2017 which is also going to be on display at the Hilton Arts Festival. 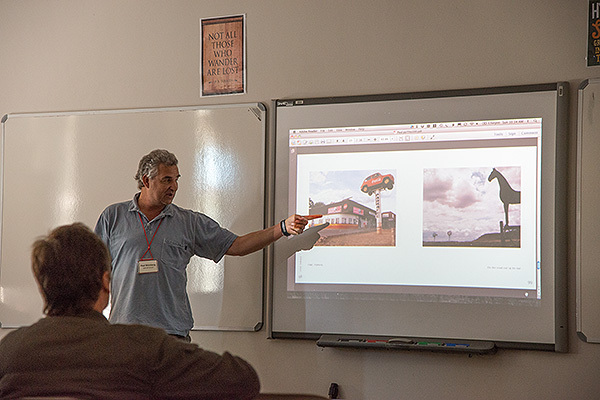 Veteran South African documentary photographer, Paul Weinberg, presenting a personal project at DocuFest Africa 2013 held at Michaelhouse in the KwaZulu-Natal Midlands. The line-up includes both veteran photographers and young talent, curators of important historic visual collections and the creators of new documentary work. 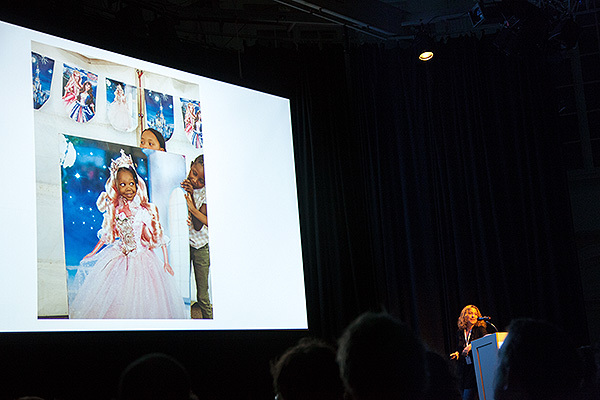 Jodi Bieber presenting at the World Press Photo Award Days in Amsterdam, Netherlands. She presented two bodies of work, Challenging Stereotypes and Soweto and also spoke about photographing Bibi Aisha, a young Afghan woman who had her nose and ears cut off by her husband’s family. In 2013 we ran the first edition of DocuFest Africa. In that event we also had a wonderful line-up of presentations and all who participated thoroughly enjoyed it. It provided an excellent platform for interaction between visual storytellers and the public. Right from the start the concept was to not only to provide a platform for leading African visual storytellers and curators to present their work and their collections to a wider audience, but we also wanted to connect that with global best practice. In that regard we invited Michiel Munekke the then Managing Director of World Press Photo to present on “Africa and Africans in World Press Photo” building on a relationship we had developed with World Press Photo during the Twenty Ten project in which we worked together with other partners to train over 100 journalists ahead of the 2010 FIFA World Cup here in South Africa. He understood the vision we had to build an event that can marry the inspiration of global best practice with the promotion of local practitioners. 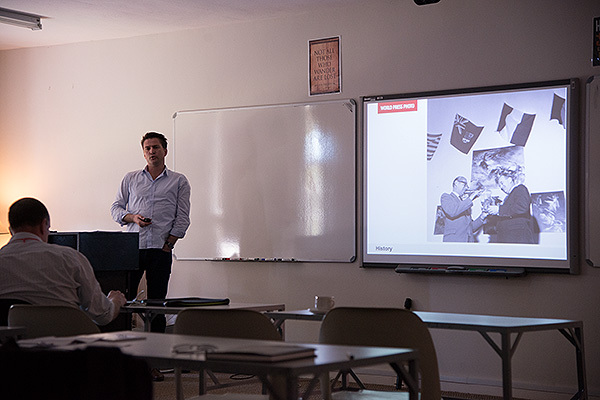 World Press Photo Managing Director, Michiel Munekke, presenting at DocuFest Africa 2013. World Press Photo wanted to support an initiative that showcased the best of African visual storytelling. While DocuFest Africa 2013 was well received by the participants and those members of the public who came, what we lacked was the crowds. We held it at Michaelhouse in conjunction with Africa Media Online’s Heritage Digital Campus. While the Digital Campus was well attended, we found it challenging to pull the crowds to the Festival. Ever since then I had been dreaming about doing it again, once again in collaboration with World Press Photo and particularly with the World Press Photo Exhibition, and this time in a venue where the crowds were already gathered. In our part of the World, the most obvious place to do this is at the Hilton Arts Festival. I made two trips to Amsterdam earlier this year in which I reconnected with World Press Photo after a break of some years and got to meet Lars Boering, the new Director. Both of us were looking for ways in which we could continue our collaboration. 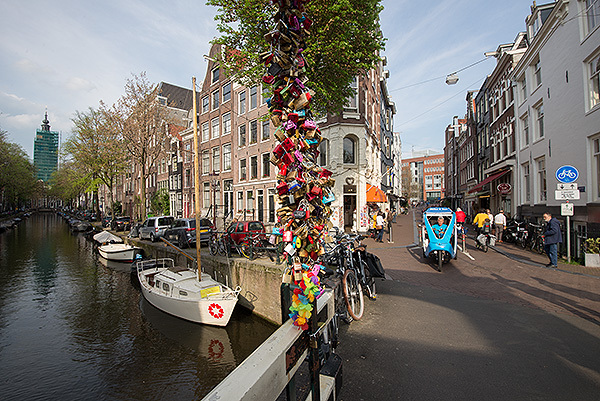 Even before I went to Amsterdam in January, I had made contact with the Hilton Arts Festival to flight the idea. They loved it and so I went to Amsterdam with some assurance that we had a good venue and a gathered crowd already lined up. The idea, then, of our hosting the World Press Photo Exhibition at the Hilton Arts Festival as an anchor around which to build other events seemed the obvious place to start, and the obvious first event to connect to it was DocuFest Africa. And so DocuFest Africa 2017 was born!